Laban and Jacob make a covenant together, as narrated in Genesis 31:44-54. Laban (Hebrew: לָבָן, Modern Lavan Tiberian Lāḇān ; "White") is the son of Bethuel, brother of Rebekah as described in the Book of Genesis. As such he is brother-in-law to Isaac and both father-in-law and uncle to Jacob. Laban and his family were described as dwelling in Paddan-aram, in Mesopotamia. Though the biblical text itself does not attest to this, Rabbinic sources also identify him as the father of Bilhah and Zilpah, the two concubines with whom Jacob also has children (Midrash Raba, Genesis 74:13 and elsewhere). Laban first appears in Genesis 24:29-60 as the grown spokesman for his father Bethuel's house; he was impressed by the gold jewelry given to his sister on behalf of Isaac, and played a key part in arranging their marriage. Twenty years later, Laban's nephew Jacob was born to Isaac and Rebekah. When grown, Jacob comes to work for Laban. The Biblical narrative provides a framework for dating these events. 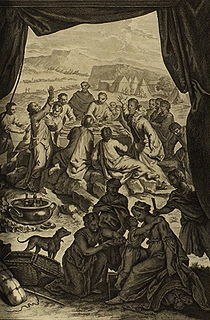 Jacob begat Joseph 14 years after his flight to Laban; Joseph entered Pharaoh's service at age 30; and from that point, after 7 years of plenty and 2 years of famine, Jacob met Pharaoh and stated his age as 130. Subtracting yields an age of 77 (Jacob at his flight to Laban). 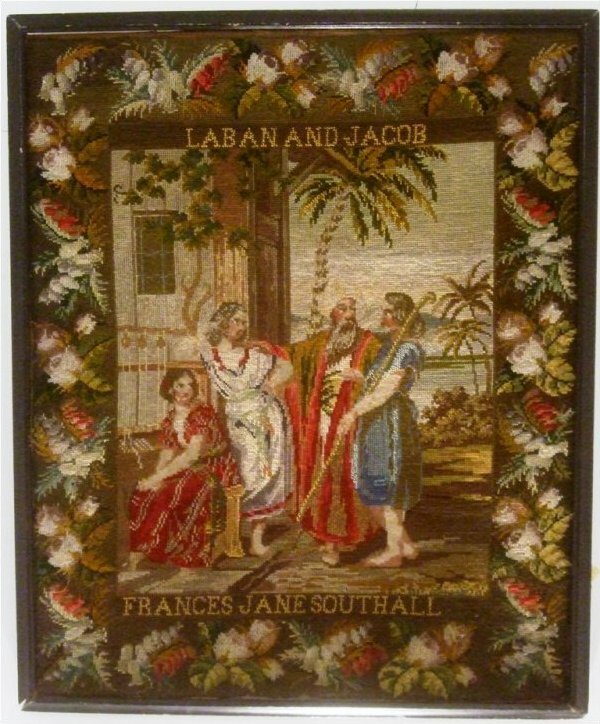 Laban was more than 30 years older than Jacob, and employed him for 20 years. Laban promised his younger daughter Rachel to Jacob in return for seven years' service, only to trick him into marrying his elder daughter Leah instead. Jacob then served another seven years in exchange for the right to marry his choice, Rachel, as well (Gen. 29). Laban's flocks and fortunes increased under Jacob's skilled care, but there was much further trickery between them. Six years after his promised service has ended, Jacob, having prospered largely by proving more cunning than his father-in-law, finally left. Laban pursued him, but they eventually parted on good terms (Gen. 31).